He has been a practicing Dentist for 10 years. He is a qualified BDS, MDS Endodontist. Book an appointment online with Dr. Chakit Maheshwari on Lybrate.com. Find numerous Dentists in India from the comfort of your home on Lybrate.com. You will find Dentists with more than 37 years of experience on Lybrate.com. 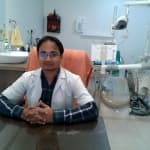 Find the best Dentists online in agra. View the profile of medical specialists and their reviews from other patients to make an informed decision. I am 18 years old male, my teeth are not in same order my front upper teeth came in outer direction, I have consulted the doctor nearby ,he said that he will remove upper and lower two two jaws and put the braces as their is no space in between ,is their any other way to level the order of teeth? hello, you can get your teeth aligned by going for orthodontic (braces) treatment. you also go for composite veneers or ceramic veneers to level your teeth. I had 2 crooked teeth so back in 2014 I got 2 ceramic crowns on them. I also needed ortho treatment so in 2017 I got braces. My doctor told me to get old caps replaced but told that it isn’t possible for me to get zirconium CAPS after the braces are removed because then he will not be able to put retainers on the backside of my teeth after braces are removed! He replaced my old caps with Ceramic + metal caps! Which is looking very fake and unmatched with the other teeth! I am not satisfied since it is on my front teeth .please tell me is it not possible for me to get zirconium Caps along with retainers? Even after braces I feel my smile isn’t looking good. Below my jaw my muscles swell up it don't pain but it looks awkward can you suggest me what should be done. If swelling comes after eating rule out sialolith consult a maxillofacial surgeon or take a occlusal cya of lower jaw n send on line. Munching foods like apples, pears, carrots or celery after brushing can help in preventing discoloration as they trigger tooth-bathing saliva which helps in keeping the teeth white. Dear Doctor, I am 21 years old,i am suffering for long days from bad odour from my mouth during speaking.Even though i am brushing properly and flossing the mouth after eating.I am still suffering from bad odour from my mouth.Still now i doesnt take any treatment.Please provide me a solution. Bad odour is also related to food like garlic, onions and food that has pungent aroma so try to avoid those and bad breath is also related to systemic problem, hereditary so kindly visit dentist so that I can get exact reason and get the correct treatment. Mine teeth is adversely affected by pan chewing - I mean beneath gums pan tartar covered how 2 remove without machining - any natural method or any paste to remove tartar. No way out get a professional cleaning/scaling and polishing done and get it done atleast once a year with withdrawal of your habit. Hi am syad 24 old hun phicle 4 mahine se mera muh gutkha khane ki wajah se nai. Khul raha hai mai kaunsa table lo tell me. Plz. Please recommend medicine for mouth ulcer. It's been two days but no improvement. Am applying quikkool mouth ulcer gel. lybrate-userEat a healthy, well-balanced diet and take one tab multi-vitamin. After meals. Using a rinse of saltwater and baking soda placing milk of magnesia on the mouth ulcer covering mouth ulcers with baking soda paste using over-the-counter benzocaine (topical anesthetic) products like Orajel or Anbesol nutritional supplements like folic acid, vitamin B6, vitamin B12, and zinc. I'm 27 years old. The wisdom Tooth is grown inside in a sliding direction. And it is too much of pain and swelling. Checked with the dentist and was advised to remove the wisdom tooth by doing surgery. Kindly advise. Yes, what you state indicates that your last molar is impacted and is obstructed by the 2nd molar in its eruption. If not extracted, it will keep on causing psin and trouble repeatedly.